really! They're such cute little sprouts too! I also bought some packets of sunflower seeds (teddy bear, and some reddish variety) to start sprouting for my mom. She's away this week, but she's been wanting sunflowers in her garden for her to snip during the summer to have beautiful flowers for the kitchen. For mother's day, we're going to be planting things in her garden so I figure I can start the sprouts now and transplant them on mother's day. I've been a pretty busy bee updating the Bay Area Knitters ring. I FINALLY placed links to everyone's blog on the main page (man, 117 people! phew!). I then invited them all to be a member of the blog so that they could add posts about activities in the area. But Blogger only lets you invite each member individually, three people each time. So that was a bit slow too! I've been planning for more spinning too--lest you think I've just been knitting/sewing and neglecting poor Wally. 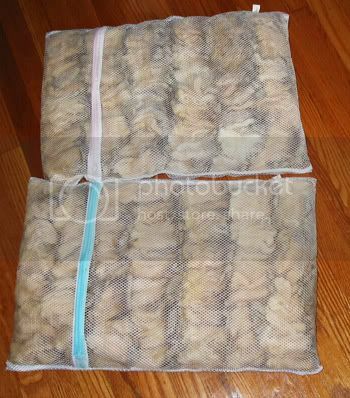 Here are a couple bags of merino x locks lined up to get ready for a bath :) I saw this technique on a couple people's blogs recently, but I can't remember whom. I hadn't spent the time to maintain the lock structure before, but we'll see if that makes a difference. 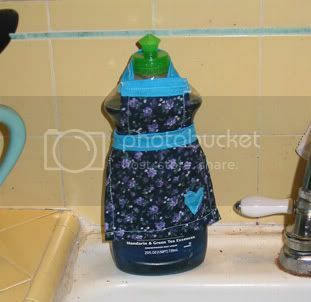 The dish soap apron is just too cute! And thanks for spending organizing the bayareaknitters blog. What a great resource. Since you spin, do you know of resources for spinners in the area? I'm a novice spinner(if I can call myself that). I know about the classes at Deep Purple Studio, but just too far for me (I live in Menlo Park). Are there classes or gatherings closer to the peninsula? The Hooray for me gloves are cute! Are you still sending invitations? I haven't gotten mine yet (she pouts). i'd love to hear how washing the locks that way works out. i usually just dump at random into a big tub! very cute outfit. maybe the soap needs a dressy/formal outfit? the iron chef... i miss that show (no cable anymore)! Thanks for the info! I'll check out them out. Okay, feeling ditzy... I'm on the Bay Area Knitters web ring, but I didn't know there was a blog too. I can't figure out how to join it, though. Do you need to send me an invitation, or am I missing the link? I love the soap apron!!! And the gloves rock!